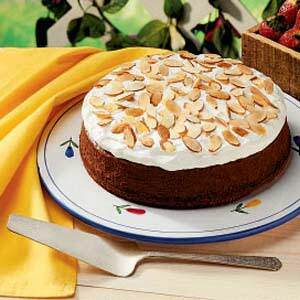 Restaurant Dessert Recipe Is Yours! Calling all chocoholics! This Chocolate Almond Cheesecake is for you! My family and restaurant guests enjoy a good meal, but whenever I feature this cheesecake recipe, everyone tries to save room for dessert. In fact, the restaurant has one guest who, after being seated at dinner time, asks the server if this particular cheesecake is available. If it is, he orders 2 pieces with coffee - no dinner. This is not a recommended practice, but he insists that is the way he wants it. The graham cracker crust of this cheesecake holds a creamy filling flavored with almond extract and is then enhanced with a layer of chocolate and almond garnish. 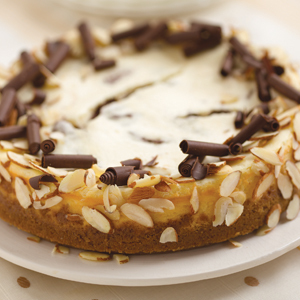 Enjoy your Chocolate Almond Cheesecake and the company of those you share it with!